Thunder Cave in the News . . . Copy of article published in the Utah Spirit magazine, 01.JUN.05 issue. Distributed from Logan to Provo along the Wasatch Front. Click here for source online. It takes a lot of courage to take a beloved children�s classic and rework it for new release while maintaining the integrity of the original author�s "voice." More than courage, it takes someone with an insatiable passion for words and language; someone like Denise G. Jones, who took on the daunting project of fine tuning of "Thunder Cave." The book originally began as a series of little pamphlets in the 1920s, written by Draper resident Jeremiah Stokes. 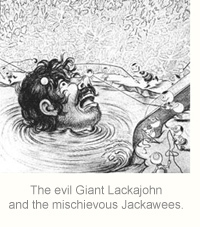 He enlisted the help of national magazine cartoonist Jack Sears for illustrations. The two had become acquainted while living in the southern United States together just after the turn of the century. In 1932 they compiled the pamphlets into a 21-chapter book, then revised it in 1945 to 18 chapters. "It was great as a series of individually published stories, but as a book it lacked continuity," said Jones of the original "Thunder Cave." It also lacked any verbal description of Sears� delightful illustrations; a necessary bridge to more firmly connect word and picture. Jones worked tirelessly to clarify plot elements; bridge gaps in the story line and "introduce" Stokes� characters rather than having them "just show up" in the text. "I got so stuck in his (Stokes') writing style, that for a year after I couldn�t get out of his �voice'," said Jones. To prepare for the task, Jones studied other books by Stokes including, "Modern Miracles," "The Soul�s Desire," and the lengthy obituaries of both Stokes and Sears. Her introduction at the front of the book clearly details her reverence for the men and their work. The revised edition of "Thunder Cave" has met with great reviews in spite of some nuances from the period that offer a slightly altered political picture from today�s enlightened minds. More than three generations of fans are snatching up the book, which has been out of print for more than 50 years. "It�s the people whose mothers read it to them as children and [who] wanted their mother�s copy, that first bought the revised edition," said Jones in an interview from her home in Centerville. "It has such a good feeling from their childhoods, that they want it back. "For me, it was my first introduction to the Black culture as a child. I liked them (Jasper and Zebbie). It set me up to accept and appreciate different cultures." The tale is a series of adventures involving two little boys, Jasper and Zebbie, whose mother and father are missing. The boys remain at home waiting for their parents until the food runs out. Then they decide to go out looking for their parents and begin their great adventure. 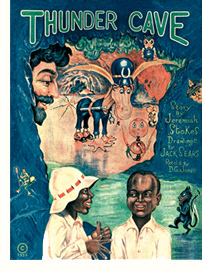 In African-American dialects similar to those of Mark Twain�s "Huckleberry Finn," Jasper and Zebbie�s culture comes to life. These are stories that must be read aloud to be truly appreciated. The feel of the words in the mouth as well as to the ear, is an all-encompassing delight. The boys meet the good Giant Wigwah, and together they encounter a variety of people and creatures including the beloved Santa Claus. The book is perfect for summer afternoon readings under a tree, bedtime, or winter nights by a fire. Each character has its own voice and culture � real or fantasy � "shades in the rainbow of humanity" as Jones calls them. Though some political thought may be "behind the times" Jones felt it crucial not to "sterilize" the dialogue. The result is a book rich in the very real differences of individuals and cultures. It makes the book "sing" on many levels. "One prays, one tries and then�hopes," Jones says of the delicate work of recreation. "I�m glad I got to do what I did with it." It�s rare to find a children�s book that opens doors of imagination while at the same time offering opportunity for important dialogue between parent and child, reader and listener. "The New Millennium Edition of Jeremiah Stokes� Thunder Cave" is just such a book. "Thunder Cave" is available at http://www.kitkooh.com/tc.html. Copyright © 2000-2013 by Allaine Kitkooh. Web Site authored & created by Allaine Kitkooh. The copyright to all goods offered through this site belongs to the author, composer and/or editors of the same. All rights to Web Site material, compilations & products sold are reserved (unless another copyright holder is specified). Images on, and the goods sold or otherwise distributed through, this site may NOT be duplicated without first obtaining written permission from the copyright holder — and then, only on a limited basis. They may not be duplicated for profit or any other commercial purpose, or for any kind of multiple distribution including the internet. KitkoohTM K.I.T.K.O.O.H.TM and kitkoohTM (or any other form, or its expanded acronym as published by this site) are trademarks belonging to D. & Ken Jones. All rights reserved. See further infomation on copyright and trademarks. Limited copyright is granted to sites such as Amazon.com to which material was submitted by the authors of this page/site. © 2000-2013 by Allaine Kitkooh. All rights reserved.